“Color Revolution” in Macedonia? Towards a New Balkans War? Oriental Review has transcribed below in English the interview of US political analyst Andrew Korybko with Macedonian Net Press agency. Korybko outlines the general landscape of Hybrid Warfare in the Balkans, exposes the regional ethnic and emotional stress-lines, stirred up by the interested supranational actors, warns the Albanian community in Macedonia against being misused as agents of destabilization. Q: According to some information in both the Macedonian and Serbian media, the Russian intelligence services are warning about the West’s intention to provoke a Balkan War, with a spiral of violence unfolding in Skopje, Banja Luka, and Belgrade. Their idea is to “show” that the governments in Macedonia, Republika Srpska, and Serbia are “weak” and that they need foreign “help” or intervention or whatever it is that they are calling their deviant attempts to manipulate and control other countries and nations. Can you share some more information regarding this issue with our readers? Thank you again Marija for giving me the chance to speak to your readers, it’s always such an honor. I’d like to begin by reminding everyone of the Central Balkans geopolitical construction that I first proposed last year, in which I suggested that Republika Srpska, Serbia, and the Republic of Macedonia are each destined to share in the same strategic fate in the coming years. This is because none of these states are in the EU or NATO, and also because two of them –Serbia and Macedonia – plan to host Russia and China’s multipolar transnational connective infrastructure projects, a gas pipeline and high-speed railroad, respectively. I’ve explained at length in previous interviews and articles about why these megaprojects are so important, but to summarize once more, their successful completion would give the multipolar Great Powers the potential to tap directly into the heart of Europe and help shift the EU closer to the emerging world order and away from the US-led existing one. Precisely for this globally transformative reason, the Central Balkans are, in my analytical understanding, single-handedly the most important region of Europe today and one of the most pivotal places in the entire world. The US is pursuing a dual track policy towards the Central Balkans, simultaneously trying to gain controlling influence over the three targeted states while also working to totally destabilize them. It might sound schizophrenic to work towards two seemingly contradictory objectives at the same time, but it actually makes a lot of sense when you take the time to analyze it. Washington would like to be able to seize control of these governments so that it can then exert indirect proxy influence over Russia’s proposed Balkan Stream gas pipeline and China’s Balkan Silk Road high-speed railway or cancel them outright, but if it’s not successful in doing so, then it would have no qualms about throwing these countries into chaos in order to offset these projects. In this sense, the US is trying to achieve a ‘win-win’ policy whereby it either controls the Balkan Megaprojects or destroys them, which in either way works to Washington’s grand unipolar strategic benefit. All of the present destabilization and uncertainty in the Central Balkans is thus linked to this strategic imperative that the US is so actively advancing in the region. Other than employing ‘regular’ Hybrid Warfare techniques such as informational and economic destabilization, the US is also resorting to ‘irregular’ ones such as the trans-regional Immigrant Crisis and more specific measures in each of the targeted states. Everything that I’m about to tell our readers about is described in detail in my “Law Of Hybrid Warfare” series at Oriental Review, where I’ve lately begun to publish the Balkan portion of my research. To begin with Republika Srpska, the US supports its Sarajevo proxy’s unilateral and aggressive piecemeal measures at revising the Dayton Agreement, seeking to progressively lessen Banja Luka’s constitutionally enshrined sovereignty in order to eventually erase it from the map. Right now only heavy informational and institutional Hybrid War measures are being used, but it can’t be discounted that more serious strategies will be introduced in the coming future. For example, we can already observe the nascent beginnings of a Color Revolution movement starting to take shape in Banja Luka and elsewhere in Republika Srpska’s major cities, and this development was of course meticulously preplanned and is in no way a happenstance occurrence. Additionally, with institutional-informational aggression being waged against Republika Srpska from the federal center and local ‘bottom-up’ pressure being exerted against it from the incipient Color Revolution movement, the last thing that the Republic needs right now is identity tension between its Serbian Orthodox minority and the “Bosniak”/Turkish Muslim minority, but that’s exactly what appears to be taking shape right now. Recalling that there have been several small-scale terrorists incidents in the area over the past year, as well as a few that were thankfully busted before they caused any harm, it’s obvious that Islamic terrorists and pro-Daesh elements are trying to return Bosnia in general and parts of Republika Srpska in particular into the frontlines of militant jihad. Moreover, Turkey is tacitly supporting this trend, as can be seen by former Prime Minister Ahmet Davutoglu’s recent visit to Banja Luka. 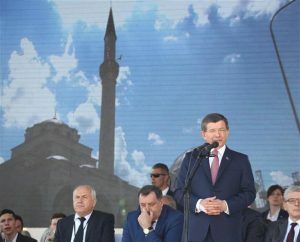 Not only did he preside over a reopening ceremony for an historic mosque – which, while marketed in the Western media as “healing tensions”, ironically only served to exacerbated them – but he said that “I came here to speak from my heart, not just on my behalf but on behalf of 78 million Turks, whom I represent here. You have 78 million friends who are with you and support you when you are sad and when you are happy.” It’s evident that not only is the Turkish government once again proclaiming that it’s returned to the region, but that it wants to actively play the front and center role in carrying out Samuel Huntington’s “Clash of Civilizations” unipolar blueprint for dividing and ruling the Eastern Hemisphere. Turkey is doing this by aggressively promoting Salafism (or the imposition of Islam across all sectors of life) in the Balkans in the precise areas where this would do the most damage to inter-communal relations, such as in the capital of Republika Srpska. Additionally, the potential EU-Turkish visa-free travel arrangement that Ankara wants to achieve would only institutionalize this trend by formalizing the Immigrant Crisis and setting it loose against the Balkans once more, with a specific focus on Turkish-friendly Bosnia. The objective is to stir up as many internal divisions as possible in places which have only just recently begun the healing process so as to scratch off the scabs of civil war and force Bosnia to bleed all over again. Erdogan’s Muslim Brotherhood vision is to turn the Balkans into the Mideast, and he and his affiliated terrorist organization see identity-diverse Bosnia as being even more vulnerable to externally supported destabilization than pre-war Syria ever was. Geopolitically, Turkey and its Salafist foot soldiers from the Muslim Brotherhood and other terrorist groups think that Bosnia is the perfect time bomb that they could trigger for setting off a large-scale civilizational war between Islam and Christianity, all in their joint quest to recreate history and return Turkish-Salafist influence all the way up to the gates of Vienna. Given where it’s located, an explosion of civil war in Bosnia would obviously have direct consequences for the rest of the Balkans and all of Europe. 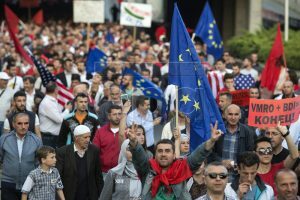 Other than possibly drawing Serbia and Croatia into a renewed state of proxy warfare in this middle-ground battlespace between them, Bosnia could also become a conveniently accessible center of jihad for Europe’s radicalized Muslims and newly arrived immigrants, thus turning Bosnia into the “European Syria” in more ways than one. And then there’s Serbia, which is an entirely different case altogether from both Bosnia and Macedonia. Here, in the middle of the Central Balkans, the US has gained a very strategic foothold, although it’s still not as secure as Washington would like for it to be. To be frank, the Serbian leadership has capitulated to NATO as a result of the recently agreed-to transit agreement, which gives the military bloc full and unquestionable rights to send its armed forces through the country for whatever the reason may be. Most realistically, this could take the form of sending NATO units from Croatia through Serbia en route to the occupied Serbian Province of Kosovo as a means of intimidating the Macedonian government and emboldening Albanian terrorists. The US was able to achieve such unprecedented rights from the Serbian government because it had co-opted most of its governing elite, which in turn used the US- and NGO-influenced national media to assuage the population and trick many of them into accepting it. The US acquired such influence over the authorities principally because of its very close relationship with Vucic, who – despite not agreeing to the anti-Russian sanctions – is rather chummy with the West and everything associated with it. Although he says that Serbia will never join NATO, that’s actually a moot point at this time because the military bloc already has all that it could ever realistically want from Serbia through its legally enshrined transit rights and heavy influence over the current government, all while not offering any single thing of real or perceived benefit in return aside from patting Vucic on the back and telling him “’atta boy!”. To be fair, though, the US did have to tighten the screws a bit and give him a glimpse of what would happen if he didn’t accept their “deal”, and this happened when an angry Bosnian Muslim mob tried to kill him in Srebrenica last summer. Although uncomfortably close to the West even before then, it was after this event that Vucic submitted to his Western “partners” and became the quisling that he is now, though it should be reminded that he still retains some hopeful traces of “independence” through his country’s military-technical cooperation, business interests, and diplomatic relations with Russia. 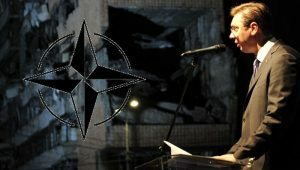 Although Serbia still has strategic relations with Russia that symbolically represent the will of most of its citizenry (though they could be substantially intensified in all spheres), the US might pressure Vucic to backtrack on those commitments and enter into a disastrous Ukrainian-style false “civilizational choice” by choosing between the West and Russia. In preparation for doing this, not only could it stir up troubles in Bosnia through the means that I just mentioned and also encourage Croatian hybrid aggression against Serbia (whether against Serbia proper or via proxy through Bosnia and Republika Srpska), but it could also obviously reactivate the regional scourge of “Greater Albanian”, which it’s already threatening to do against the Republic of Macedonia. If it decides to take a “milder” approach towards bullying Belgrade, it could continue to stoke the minority tensions that Romania and Bulgaria have recently hinted at regarding their affiliated ethnic ‘compatriots’. This last option is the least disruptive in the short-term but could eventually lead to very severe long-term repercussions in further dividing the Serbian citizenry amongst itself based on externally supported identity cleavages, thus making it less likely that patriotic members of the populace could succeed in peacefully rising up to oppose their mostly pro-Western government since they’d have many more perceptively immediate and local challenges to contend with first (i.e. the disgruntled and possibly disruptive Romanian- and Bulgarian-affiliated minorities). Finally, about the Republic of Macedonia, the most pivotal bottleneck country in all of the Balkans is currently being wracked by multiple Hybrid War plots, some of which have matured and others of which are still latently developing and being nurtured for later deployment. Many of my previous articles and interviews about Macedonia touched upon the threat of a Color Revolution creating the cover for “Greater Albania”, and that’s actually what’s playing out before our eyes right now. Just recently there was some chatter coming from the Albanian community and their international US/NGO-influenced media supporters about potentially “federalizing” Macedonia, which in effect would amount to an internal partition prior to a formal international one. None of this is happening by coincidence, either, since the attacks against the country’s cultural and historical landmarks demonstrate that there is a concerted war being waged against Macedonia’s identity, all with the intent of sowing divisions and ‘reverse engineering’ a divisive ethnic problem prior to proposing the preplanned ‘solution’ of Western-suggested “Identity Federalism”. Right now the US-controlled “opposition” is on “time-out” as they scramble to reposition themselves after the government’s surprise move to postpone the 5 June elections and reconvene the former VMRO-led parliament, but once they and their foreign patrons recalibrate themselves to the new on-the-ground reality, it’s expected that they will continue to press forward with their destabilization and merge the Color Revolution movement with a “Greater Albanian” nationalist one. Together, both of these groups would then likely propose “federalization” as part of their joint platform, with the subtle hint being that if the government doesn’t capitulate to their demands (which will obviously at some point or another involve changing the constitutional name of the Republic of Macedonia to reflect this new prospectively “federalized” entity), then the situation could quickly become violent and lead to another outbreak of Albanian-led terrorism. It’s this “wink-wink” type of threat that the US and its on-the-ground allies were preparing to level against the Macedonian authorities, but then President Ivanov and the government brilliantly changed the entire paradigm and disrupted the convergence between the Color Revolution and Albanian nationalist movements through his latest announcement. In response, he and the government bought valuable strategic time while both of these anti-government forces are forced to adapt to the changed situation and modify their meticulously preplanned strategies. By abruptly changing the political situation, especially in such a clever way as reconvening the VMRO-led parliament, President Ivanov and the President of the Parliament staved off an imminent escalation of the regime change movement and what would have otherwise been its imminent progressive evolution from a Color Revolution to an Unconventional War (or the unfolding of Hybrid War, to reference the author’s original theory on the matter). Putting everything into a larger geopolitical perspective and returning to the themes first mentioned at the beginning of this interview, the Republic of Macedonia is on the frontline of the New Cold War and the US’ unipolar connivances in simultaneously seeking to either sabotage or gain control of the multipolar world’s transnational connective infrastructure projects through the Central Balkans. What happens in Macedonia will determine the course of events further ‘upstream’, meaning that if it continues to successfully resist the US’ asymmetrical Hybrid War aggression and Washington realizes that it cannot gain controlling influence over the country and thenceforth the projects that run through its territory, then it will either try to completely destroy Macedonia through a vengeful fit of “geopolitical scorched earth” tactics (to deprive Russia and China of using it as a partnered transit state) and/or intensify its destabilization schemes against Republika Srpska and Serbia. Q: It is now more than clear that most of the Western NGOs in Macedonia, but also elsewhere, are being given the role to overthrow the “recalcitrant” governments that are not willing to break their backs and bow to Washington and Brussels’ wishes in going against their national interests. At the same time, we have Western ambassadors trying to interfere and control every aspect of the internal affairs of the country, while Western officials have made it clear that they do not support elections, meaning they want to continue ignoring the will of the majority of the Macedonian people. How do you comment on the way Macedonia is fighting this second round of the Color Revolution? The first thing that I need to say is that the Macedonia people have shown remarkable restraint in resisting the “opposition’s” many provocations. I can’t imagine how furious the average person must feel after seeing their beloved historical landmarks desecrated and vandalized in the manner that has been happening across the past month. I’m sure that this strikes at the heart of every single Macedonian, but all patriotic citizens can know that every civilized person in the world is also disgusted at what they’re seeing. I have no doubt that the citizens of many other countries would respond with violence to these provocations and feed into exactly what the “opposition” and its foreign supporters want, so I have so much respect for the Macedonian people in refusing to fall for this tempting bait. The other thing that I’d like to comment on is the activities of the Citizen Movement for Defending Macedonia (GDOM), which has done an astounding job in demonstrating the ins and outs of reverse-Color Revolution technology. To bring the reader up to speed, I recently publishedan exclusive analysis at The Saker about how the disciplined and select use of some aspects of Color Revolution strategy could be employed in both countering this technique (like in Macedonia) and in peacefully pressuring governments that become too uncomfortably close to the West (like in Serbia and especially Montenegro). GDOM has successfully shown that the US’ regime change plans can be cleverly countered through patriotic “regime reinforcement” movements that complicate the practice of Color Revolutions and make it all the more difficult for hostile external elements to divide society. 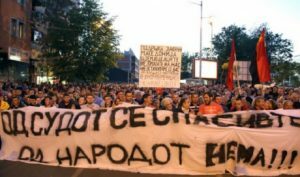 GDOM mobilized communities all across the country and powerfully showed the difference in grassroots support between the large groups of nationwide pro-government supporters and the scattered collection of Skopje-based anti-government “opposition” protesters. Switching gears to look at the government for a moment, they’re also certainly worthy of praise for exercising a similar level of patient restraint in dealing with the vandalizing “opposition”. While some have criticized it for not ordering a firmer response to the criminals, these voices might not be aware of the fact that Color Revolutionaries and their supporters routinely tempt the government into doing just that in order to manipulatively fuel intense anti-government resentment (whether real, imagined, or exaggerated). Whenever Color Revolution-threatened governments come down too hard or forcefully on the rioters (whether or not this is justified, which it is in just about all cases), they risk falling into an inadvertent trap whereby their dispersal tactics and other similar responses are photographed, videotaped, and widely disseminated across social media in a misleading and decontextualized manner. More often than not, they’re turned into memes and “viral” news events that purport to show “unprovoked government/police violence against innocent unarmed protesters”, even though there’s a very high chance that this wasn’t the true case at all. The whole point of such a charade is to stoke anti-government sentiment among the targeted population and the international (Western) community in order to accelerate the Hybrid War against the country and lay the false foundation for the imposition of a punitive sanctions regime against the recalcitrant authorities. Finally, we have the government’s political response to the Color Revolution, which was ingenious, if I may say. While the announcement to postpone the 5 June elections may have caught some people off guard and initially come off as a capitulation to the “opposition”, that’s actually not the case at all, since a more detailed look at everything that was announced reveals that the original VMRO-led parliament has been returned. This in effect left the “opposition” without any strategy whatsoever since they did not at all anticipate that President Ivanov would make such an unexpected move. While seeming to cave in to their demands by postponing the election, he really tricked them by then reinstituting the previous government. They no longer have any power, which is ironically what would have been the case anyhow had the elections gone forward, especially seeing as how VMRO was beating SDSM in the pre-electoral polls by a 3:1 margin. The strong patriotic civil society movements that rallied in support of the government were instrumental in its decision to return the parliament to the way that it originally was, and also in convincing the authorities that they had the backing of the people in doing this, which is the essence of true democracy. On a tactical level, President Ivanov’s moves came at the perfect time and prevented the Color Revolution movement from combining with an emerging Albanian nationalist one and moving the country closer to violent Hybrid War. At this moment, both the Color Revolutionary and Albanian nationalist forces are left without any concrete strategy since their previously plotted plans have now been completely scuttled. Thus, they need to wait for further orders from the US, which is frantically seeking to improvise a temporary strategy in responding to the government’s skilled maneuver. Reviewing the US Embassy’s reaction to the matter, it can be predicted that Washington might try to go forward with the earlier mentioned “federalization” plans that I spoke about, although maybe not right away and only after they formulate a clearer approach to this issue. The reason that such a forecast can be made is because of the inclusion of the highly-symbolic phrase about how “difficult reforms…must be inclusive and incorporate the perspectives of opposition parties and civil society”. While one might read this as pandering to the Color Revolution “opposition”, it can also be interpreted as a signal to the Albanian nationalists that were already on the verge of merging with this group. It’s important to point out at this time that there’s really no objective reason for why some Albanians would even want to “federalize” (internally partition) the country except out of their misguided nationalist pursuit in seeking to replicate the calamitous Kosovo scenario and construct “Greater Albania”. No minority group in the world has better constitutionally enshrined rights than the Albanians who live in the Republic of Macedonia. The only likely explanation for why some members of this demographic might want to agitate for even more generous privileges than they already have, and thus risk throwing the country into chaos and reversing all of their existing gains as result, is because of the influence of external actors that don’t sincerely care about their welfare, such as Albanian-based nationalists and the Albanian, Turkish, and American governments. These entities don’t acknowledge the truth that Macedonian Albanians have a better quality of life and more constitutionally guaranteed rights than any other category of Albanian anywhere else in the world (including in Albania proper), but instead perniciously seek to mislead them into falsely thinking that they’re experiencing the exact opposite and are victims of “system oppression”. A cocktail of Albanian, EU and US flags in hands of duped Albanian elements in Skopje. These agents of influence want to provoke the Macedonian Albanians into counterproductively carrying out a recreation of the Kosovo scenario, by which they’d sacrifice all of their former benefits in order to have a failed-“state” separatist entity that they can nationalistically claim as their own. 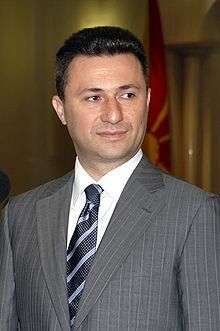 No self-respecting and level-headed Albanian would ever want their community to follow in “Kosovo’s” dysfunctional footsteps, especially after being granted all of the institutional advantages that they have in the Republic of Macedonia, so the only way to manipulate this demographic into working for its own destruction is to hold out the irrational ‘dream’ of “Greater Albania” as a means of exploiting their emotions and getting them to take moves in contradiction of their logical self-interest. As ginned up and angry as the US and its allies (including NGOs) may have gotten some members of the Albanian community, they thankfully no longer have a ‘trigger event’ to express their rage against nor a coherent framework for actualizing it either. The Color Revolution is taking a brief “time-out” as it waits for instructions for how to proceed amidst the new strategic-political environment that President Ivanov produced, and the 5 June early elections that would have functioned as the most dramatic day of their protests have now been indefinitely postponed. In one fell swoop, the Macedonian government, with the full backing of the patriotic masses that undergird its popular support, temporarily neutralized both the Color Revolution itself and its prospective “Greater Albania” “federalization”-internal partition allies, depriving both of them of the ‘excuse’ to take to the streets and thus stripping away any ‘plausible legitimacy’ that they may have been falsely thought to have in the eyes of international observers. It’s not to say that either of these threats have been permanently resolved – they still remain and will likely return with a vengeance very soon – but that they’ve been sidelined for the time being in what unequivocally represents a stunning victory by the Macedonian government in deflecting the US’ preplanned escalation of the Hybrid War crisis. Q: During this period we see the whole Western propaganda media machinery aggressively attacking the government of VMRO-DPMNE, while their main target seems to be its leader Nikola Gruevski. This demonization of Gruevski is being done in a very similar way like it has been for years now when it comes to the Russian President Vladimir Putin. For example, they are calling Gruevski a dictator, although his ratings are 6 times higher than the ones of the opposition leader Zoran Zaev. What are the mutual characteristics that made both Putin and Gruevski such a big “enemies” of the West? The most important trait that former Prime Minister Gruevski and President Putin have is that they’re conservative patriots, meaning that they emphasize traditional values, national history, and the promotion of state sovereignty. Both leaders are also multipolar in their global outlook and manage balanced foreign partnerships. Gruevski is working with both the West (US and EU) and the East (Russia and China), while Putin is doing something very similar (despite the US-controlled EU’s anti-Russian sanctions). Furthermore, these two men are both very proud and are in no way submissive to the will of anyone besides the collective populations that they represent. Neither Gruevski nor Putin can be bought off like Vucic, nor can they be blackmailed like Merkel, and this irritates the US unlike anything else. Western information warfare against the former Macedonian Prime Minister and the Russian President is nothing more than a vain attempt to besmirch them personally in order to discredit them politically. The US thinks that a flurry of unfounded attacks against both of these leaders will eventually lead to an increasing share of the targeted population accepting them as truth and then disowning the multipolar and conservative patriotic ideals that these two represent. Nothing could be further from the case, however, because as we all see, Gruevski and Putin represent the popular will of their people and were democratically elected as a reflection of that. When the US and its allied informational organs attack either of these two leaders, they’re thus essentially attacking these countries’ citizens and their countries-civilizations, which in turn prompts the people to rise up and defend them in a way which is totally foreign and incomprehensible to any post-modern Westerner that has ditched their national identity and civic-civilizational patriotism. Q: Let’s talk a little about the profile of the supporters of the so called “opposition”. We have been seeing protests in Macedonia in which the “opposition” is vandalizing and destroying not only monuments, sculptures, and buildings with the most important Macedonian symbols beginning from the times of Ancient Macedonia, but they are also attacking Christian symbols, such as crosses and angels. Having in mind that their moves have been orchestrated and dictated from abroad, what is the exact message that their patrons are sending to us by destroying Macedonian and Christian symbols across the country? These attacks are all orchestrated with a singular intent in mind, and that’s to wage war against the Macedonian identity in preparation for later changing the country’s name and internally partitioning it through “federalism”. What all of these acts of criminal vandalism have in common is that they’re designed to destroy the idea that Macedonia is an ancient Christian civilization, the three main tents of its identity that make it what it is today. If one strips away the millennial-long history of Macedonia, its Christian heritage, and its civilizational attributes, they’re essentially left with a nondescript amorphous political entity that can be remolded to whatever else that influential international forces want it to be, much like the stereotypical Western European state is nowadays. In the current context, the foreign-supported regime change movement wants to change the country’s constitutional name, but they won’t ever succeed and get away with it if Macedonians are still aware of their unique identity and remain distinctly proud of it. 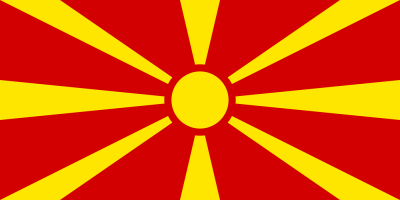 Right now there’s no way that a clique of coup plotters could pull off this off without a level of civil resistance against them unseen since the Ottoman and Fascist occupations, but if the people are diluted in their sense of patriotism and no longer care about Macedonia or being Macedonian, then it would be considerably easier to “legitimize” this stunt and possibly even hold a referendum to “justify” it one day. I don’t think that this strategy will ever succeed, but what I’m saying is that this is the American thinking behind it, whether or not it’s grounded in reality. Truth be told, it’s actually one of the most counterproductive Color Revolution techniques that I’ve ever studied because it’s inadvertently (but predictably) strengthening the patriotic backlash against the foreign-supported regime change provocateurs. It is totally unheard of for a Balkan people to destroy their own heritage, with such violent attacks against historical objects only occurring whenever one group did this against another, like when the Albanians ran wild and destroyed churches, cemeteries, and just about anything else Serb-related that they could get their hands on in occupied Kosovo (and are still doing to this day). Even so, the Albanians did not make it their officially acknowledged policy to do this, despite it essentially being so in practice. The only groups in recent memory to publicly proclaim that the destruction of historical monuments is a foundational part of their political platforms are Daesh and the Ukrainian Nazis, so it’s clear to all where these Color Revolution goons are drawing their ‘inspiration’ from, as well as who’s directing them to do all of this. To reiterate, it is not natural at all for any people – let alone a Balkan one with thousands of years of heritage like the Macedonians have – to destroy their cultural and historical monuments just because of a manufactured political dispute, but if one realizes that they’re being ordered to do this as part of a foreign power’s grand geostrategic plans, then everything that’s going on makes a lot more sense. Everyone should also be aware that the US purposely ordered its proxies to deface and destroy historical and religious buildings, objects, and symbols in order to intimidate the majority Christian Macedonians into accepting a forthcoming “federalization” of their country that would decrease their role over national affairs and replace it with that of the Muslim Albanian minority. I want to be very clear so that I’m not misunderstood or purposely taken out of context by some – I do not in any way support identity conflict and I think that it is the most destructive type of violence that could ever happen to a country because it pits its own citizens against one another, but the US is clearly trying to provoke a Christian Macedonian-Muslim Albanian war inside the Republic of Macedonia, and it’s using the Color Revolution “opposition’s” attacks against history and religion as one of the means in instigating it. Nobody should be fooled into thinking that the average Albanian is in favor of any of this, and while there may be incidences of a couple provocateurs committing this atrocious behavior, they in no way represent the majority sentiment of this demographic. Still, what’s happening is clear, and it’s that the US is trying to court the ‘hearts and minds’ of Macedonian Albanians in getting them to partake in this anti-historical hooliganism en masse. All of the Republic’s citizens –Macedonian and Albanian – must be alert to this threat and not fall into the manufactured “clash of civilizations” trap that the US is setting for them. Christian Macedonians must refrain from reprisal attacks against Muslim and Albanian buildings, objects, and symbols if any of this minority demographic are caught carrying them out against the majority, just as Albanians need to resist the US’ pressure to commit such crimes and immediately disown any members of their community that are stupid enough to do so. All of Macedonia’s identities should also unite in helping the city authorities clean up the mess that the Hybrid War vandals make, as this would be symbolically powerful and go a long way in diffusing any inter-communal tensions that the US tries to spark. Andrew Korybko is the American political commentator currently working for the Sputnik agency. He is the post-graduate of the MGIMO University and author of the monograph “Hybrid Wars: The Indirect Adaptive Approach To Regime Change” (2015). The interview was taken by the NetPress correspondent Marija Kotovska.